Friends forever! 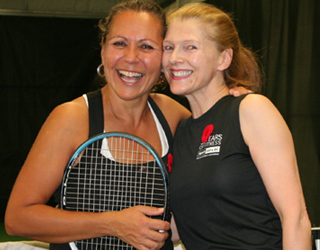 Brenda Dean, left, and Colleen Ostlund having a laugh after their match at the Hollyburn Country Club's seniors tournament, November 12. Colleen spoiled Brenda's birthday by beating her 6-4, 7-6, in the Women's 45 Singles semis. Photo 1 (left): Nick Brummelkamp beat Steve Yesowick, 7-5,6-4, to win the Men's 45. They have played against each other 7 times with Nick leading their overall head-to-head 5 to 2. Photo 2: Bob Langford, left, and Doug Holman. Bob, the last year's winner, lost to Doug in the Men's 55 final, 7-5, 6-2. Photo 3: Ken McBean, the top-seeded in the Men's 55, fell to Doug Holman in the semis with weird score of 6-1, 1-6, 6-0. Photo 4: Tennis BC's Anne Bees, left, and tournament director, Rob Fought. Rob with his doubles partner, Tony Macken beat Curtis Brennan and Stephen Keys, 6-0, 6-2, to win the Men's 45 Doubles title. Photo 5: Mark Harrison outplayed Matt Elyasi, 6-1, 6-0 in the Men's 35 Singles. Photo 6: Pho Nguyen overcame Joel Milne, 7-5, 6-3, for the Men's 30 title.